From Steve Bates an anointed Child of the Most High God, Our Father and a servant of Our Master, Yeshua the anointed one of Israel and the whole earth. May the grace of Our Father in Yeshua continue to reign in your heart giving you a peace that surpass all understanding. 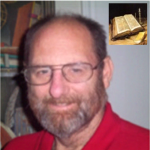 Steve Bates and anointed Disciple and Teacher of the Living Word, for the edification of the body Yeshua, in the hope of the resurrection at His return as King of Israel and the whole earth.